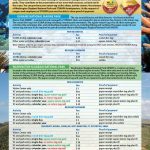 The sea around Bonaire and Klein Bonaire – the Bonaire National Marine Park (BNMP) – is protected and managed by STINAPA. The Marine Park surrounds the entire island from the high water mark to the depth of 60 meters (200 ft). 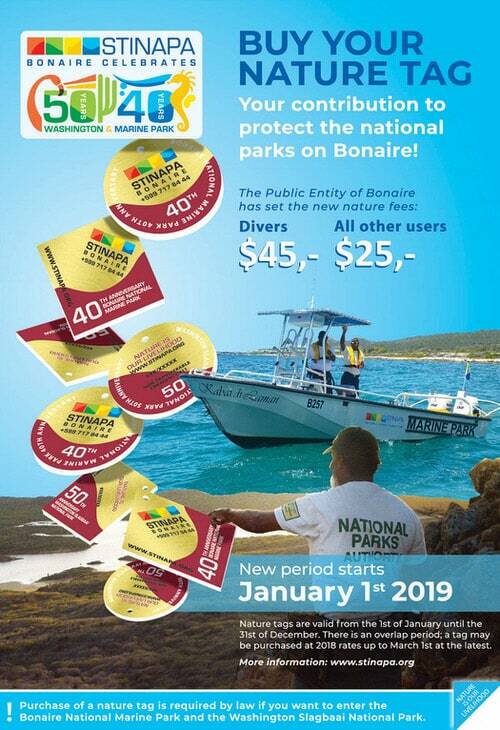 All activities in the Bonaire National Marine Park are subject to payment, including SCUBA diving and other water activities. 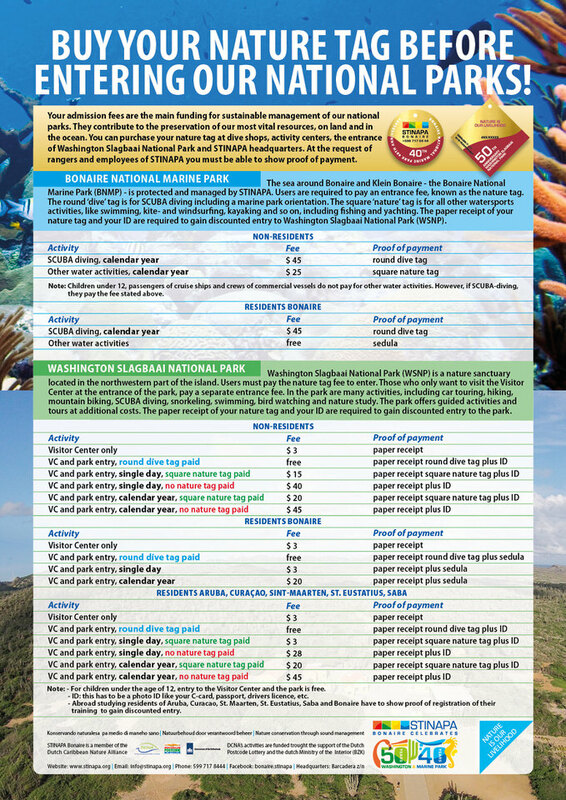 Payment can be made at all dive shops, the Tourism Office in Kralendijk, at all STINAPA offices, or the activity desk of most hotels. Please see the chart below to understand the fees for different activities and the proof of payment that you will need to provide to STINAPA rangers and personnel on request. Scroll down to find the video explaining the new nature fee in 2019 or click here to go to the webpage that explains the change in more details. Note: Children under 12, passengers of cruise ships, and crews of commercial vessels do not pay for non-SCUBA water activities. However, if diving, they also pay the fees listed above and are required to provide proof of payment on request. 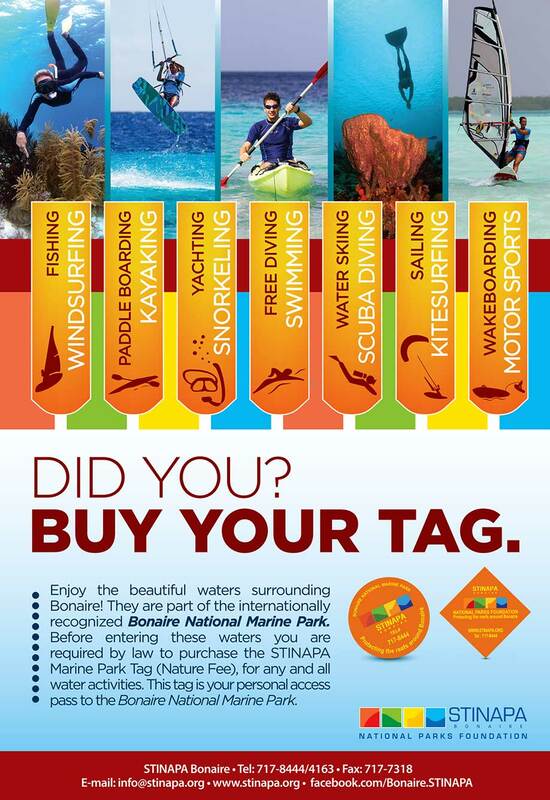 And while you’re in Bonaire, make sure to visit Washington Slagbaai National Park. Washington Slagbaai National Park is a nature sanctuary located in the northwest part of the island. Users must pay the nature tag fee to enter. Those who only want to visit the Visitor Center at the entrance of the park, pay a separate entrance. In the park are many activities, including car touring, hiking, mountain biking, SCUBA diving, snorkeling, swimming, bird watching and nature study. The ark offers guided activities and tours at additional costs. The paper receipt and your ID are required to gain discounted entry to the park. Please see the chart below for an explanation of the entrance fees. Note: For children under the age of 12, entry to the Visitor Center and the park is free. -ID: this has to be a photo ID like your C-card, passport, drivers license, etc. – Abroad studying residents of Aruba, Curacao, St. Maarten, St. Eustatius, Saba and Bonaire have to show proof of registration of their training to gain discounted entry.